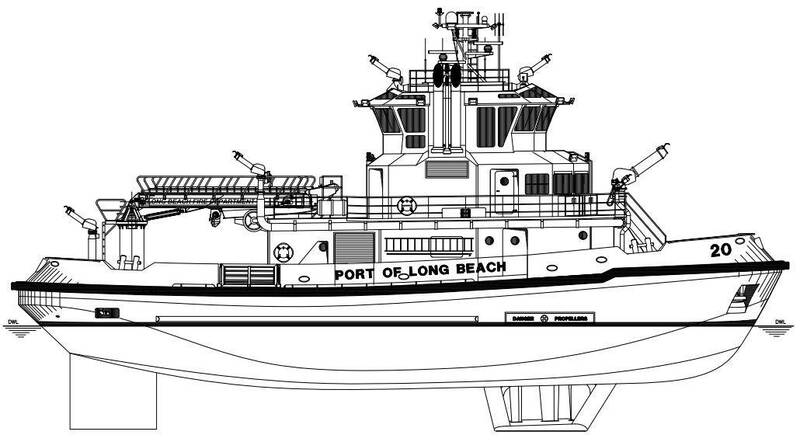 Robert Allan Ltd. announced that it was selected to be the Owner’s Naval Architect for the design and construction of two new fireboats for the Port of Long Beach. Custom designed for service in the U.S. port, the fireboats will be operated by the Long Beach Fire Department and will be amongst the largest fireboats in North America. The vessels are to have a maximum speed of 12 knots, a low wash (less than 12”) speed of eight knots and onsite endurance of five days. Control stations are located both forward and aft in the wheelhouse, with bidirectional operation and visibility of all working deck areas being a key feature. Exceptional low speed maneuvrability and stationkeeping are provided by the Voith Schneider propulsion system. Extensive CFD studies have been conducted to verify the performance parameters, as they are critical to operation of the vessel in this sensitive environment. Propulsion power is being provided by a pair of Caterpillar 3512C Main Engines developing 2,012 bhp at 1,600 rpm, which are driving two Voith Schneider Propellers VSP 26GII/165 AE45. An additional two Caterpillar 3512C engines, and one Caterpillar C12 engine will team up with the drive engines to power the array of seven firefighting pumps, ranging in size from 2,000 GPM to 8,000 GPM with a total aggregate capacity of 41,000 GPM. The vessels will be equipped with ten monitors in total, the largest capable of delivering 12,000 GPM at a 600’ range. This monitor alone exceeds the requirements of a National Fire Protection Association (NFPA) Type II fireboat. In addition there will be nine other monitors ranging from 1,500 to 6,000 GPM. Two of these monitors will be able to deliver 6,000 GPM of firefighting foam at a range of 500’. There are four hydrants with a capacity of 500 GPM in conjunction with the shoreside supply of up 22,000 GPM. The vessel will have a normal crew of 4, with the ability to carry up to 12 supplementary firefighters with gear, or various support personnel such as SAR techs, EMS responders and dive teams. In addition to developing the technical design drawings and specifications, Robert Allan Ltd. worked with the Port of Long Beach to assemble to the complete bid package for the construction phase of the project. 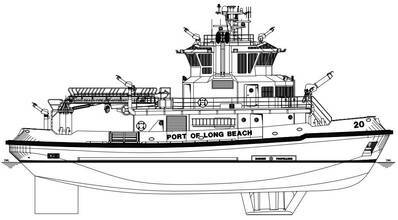 In September 2012, the Port of Long Beach issued its Notice Inviting Bids to Shipbuilders interested in building the new fireboats. Robert Allan Ltd. provided support to the Port during the bid phase, by responding to technical questions from bidders. In late 2012, The Port of Long Beach selected Foss Maritime Company to build the vessels at the Foss Seattle yard. Construction of the first vessel is well underway, and Robert Allan Ltd. continues to support the Port of Long Beach by providing quality assurance for the project and onsite technical services at the shipyard.